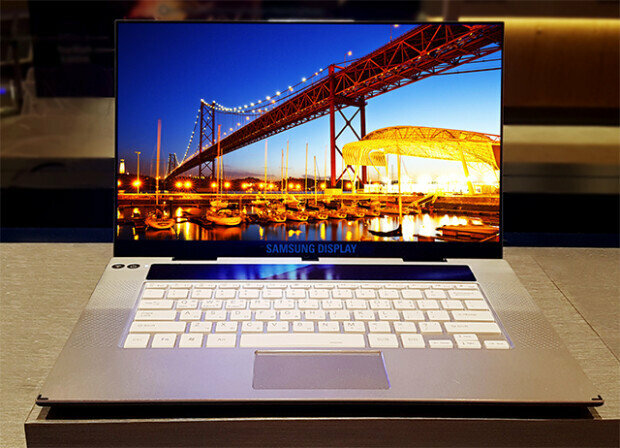 Samsung develops world’s first UHD OLED panels for laptops. January. 24, 2019 07:41. by Ji-Hyun Kim jhk85@donga.com. Samsung Display Co. said Wednesday it has developed the world's first organic light-emitting diode (OLED) display with ultra-high definition (UHD·3840×2160) for laptops. The Korean computer parts industry views the announcement as a signal that the predominant player in the mobile OLED market plans to expand the market to mid- and large-sized display panels. Industry experts also say that Samsung Electronics Vice Chairman Lee Jae-yong visited Samsung Display’s production plant late last year to call for the development of next-generation display devices, adding weight to the tech giant’s investment in and development of larger OLED panels. Samsung Display said it plans to begin the mass-production of the 15.6-inch UHD OLED panels next month to supply them to global laptop makers including Lenovo, Dell and HP. The consumer electronics industry is paying keen attention to whether Samsung Display will make a foray into the OLED panel market for large television sets. The company is effectively a monopoly in the global small- and mid-sized OLED panel market with a more than 95 percent share but has promoted liquid crystal display (LCD) panels for large TVs.